Many of us lose, or more accurately, ‘misplace’, our keys on a regular basis. Your keys, whether they’re house keys, car keys or both sets on the one keyring, are important and you must make sure they don’t fall into the wrong hands as the security of your home or car would be compromised. Whether you’ve lost keys in the past or you have an excellent track record and would like to keep it that way, the following tips can help you to keep up to date with your keys’ location at all times! Bulky doesn’t mean heavy, ugly or cumbersome, but when you attach a large keychain to your keys it helps you keep better track of them. What’s more, if you keep your keys in your pocket, it also reduces the chances of your keys falling out when, for example, you reach for your phone or wallet. Our auto locksmiths frequently cut new car keys for motorists who’ve lost their keys, often due to them falling out of pockets and purses. It isn’t a great look, but attaching a lanyard to your keys for those times when you aren’t carrying a handbag or wearing jeans/trousers with sufficiently deep pockets can help you to not lose or misplace your keys. This will also help you to avoid having to call an automotive locksmith and pay for a car key replacement. There are some great apps that can be used to help you to avoid losing your keys and wallet/purse, etc., such as Tile, which features a tiny Bluetooth tracker that connects with a smartphone app. While this is very handy, what happens when you can’t find your phone? Placing a key box near the front door is an excellent way to keep tabs on your key’s whereabouts at home. It’s wise not to place the box right beside the door where it could be accessed by someone reaching around the doorway. 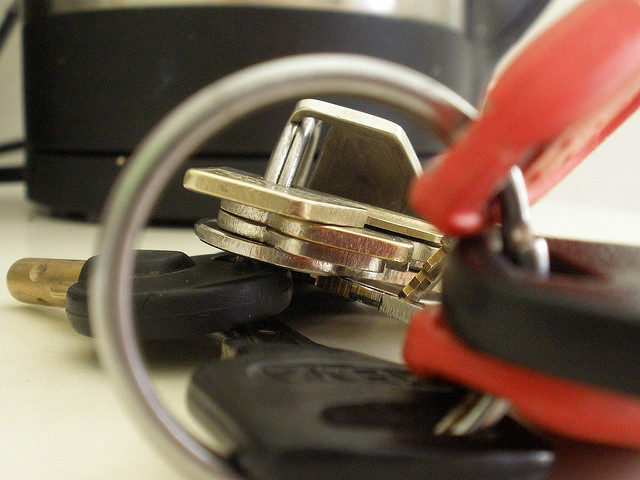 Losing your keys can be a nightmare, but with our 24-7 locksmith service help is at hand. Whether you’ve misplaced the car keys (or locked them in the boot) and need an auto locksmith’s assistance, or you’ve lost your house keys and need a new set cut, Action Lock Service has you covered. If you’ve locked yourself out of your house, one of our mobile locksmiths can get you into your home without damaging the lock or door in about 10 – 30 minutes. To have new car keys cut without a spare, ensure you have the following information ready: VIN, personal ID, car make and model, registration number and your location. If you believe your house keys may have been stolen, we can rekey your existing locks which is a more affordable alternative to having new locks installed. For 24-7 automotive, commercial and residential locksmith services across Perth and surrounds, contact Action Lock Service on (08) 9240 7200. Alternatively, for general enquiries please send an email to [email protected].